With Halloween less than a week away, allergy friendly halloween treats have been on my mind. Being on a special diet myself, I’m conscientious of the kiddos and their diet restrictions as well. In fact, two out of my three nephews have allergies / food intolerances. One of them is severely allergic to nuts, while the other is on a gluten and diary free diet. Halloween is often a stressful time for them, because they know that they won’t be able to eat most, if not all, of their halloween candy. My one nephew even opted out of trick or treating last year because of this fact. That was so sad to watch. I can’t imagine not going trick-or-treating as a child. It was the best holiday! You got to dress up AND get treats! AMAZING!! There has to be a better way for kids with food allergies and, it turns out, there is. 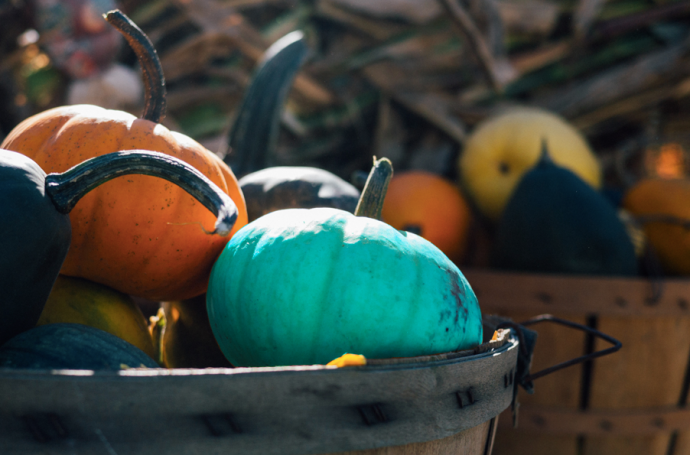 Trying to find allergy friendly halloween treats that are food-based is tricky. The main allergens are nuts, milk, soy, eggs, wheat, fish and shellfish (note that this is not an exhaustive list). Rather than try to find candies that are free of allergens, a better and quicker alternative is taking a run to your nearest dollar store and picking up non-food treats. Here are some ideas for non-food based Halloween treats. Or whatever else you find at the dollar store that you think kids will love! I had a colonoscopy (or a “scope” as us kids who are in the IBD scene like to call it) as a follow-up a little while back and it was quite the ordeal. I had been off meds since August 2011 and the docs wanted to see what the heck was going on. So, I had a scope. Now, if any of you have ever had a colonoscopy, y’all know how dreadful the process is. They make you take this horrid laxative and fast the day before. Imagine being on the toilet the whole day, basically peeing out of your bum (I apologize for the candidness) and then not being able to eat anything! It was like a Crohn’s flare-up prescribed by a doctor! It sucked! Anyhoo, I went to the hospital for the “procedure” (I think it’s important to use many quotations when discussing ugly health stuff, I’m not sure why, but I think it’s important), put on the gown and awaited my destiny. Now, the thing is that for some reason unbeknownst to me, anesthesia doesn’t fully work on me. I’m out — in the sense that I cannot move anything — BUT I can hear what is happening around me. I’m already in a sucky state because I’ve had diarrhea for the past 24 hours, I am HUNGRY and, on top of that, I am freaking out because I’m afraid that the GI will find the Crohn’s still active. And then I hear the dreadful words from from the GI, “Ooo there it is.” The “there” being the ulcers — so I think. Those words would haunt me for the next couple of hours. The next thing I know, I’m back in the recovery room, I wake up and remember what I heard. I am crushed and the tears start rolling down my face. I had worked so incredibly hard for the past year and a half getting myself healthy: I totally changed my diet, quit my job, went on meditation retreats, did intensive therapy. I did EVERYTHING to get rid of the toxins from my body – WHAT MORE COULD I POSSIBLY DO?! After all my hard work, giving everything I could possibly give to heal my body and my mind. I failed. WHAAAAAAT?! WHAT THE #$%^ did I hear when I was under then?! God knows, maybe the anesthesia does work on me and I was dreaming the whole thing! Well whatever it was, I was just glad to get validation from the doctor of my good health, get the bejeezus out of my hospital gown and go home to eat my super power breakfast (although I did have a Vega Smoothie on the ride home). I told my family the good news, they were all really happy for me. The weird thing though, was that I wasn’t. A few days passed and I was feeling kind of depressed, like a dark shadow was following me. I was taking a shower and then it finally hit me! Crohn’s was officially behind me and I (or a part of me) was sad to see it leave! This was Crohn’s! MY Crohn’s! (Side note: NEVER identify with a disease, don’t ever say MY Crohn’s, MY flu, MY cancer. It’s definitely not yours, don’t give it that power) Crohn’s, who had changed my life for the better or for the worse (definitely for the better). Crohn’s, who’d enabled me to take time off of “life” to rest and to heal and to learn about me! It sounds so cheesy, but it is true! Without Crohn’s I would NOT have quit a job that was stressful, I would not have gone to all these meditation retreats which let me really breathe after 26 years of NOT breathing! Crohn’s gave me the push to get the therapy I so desperately needed, and to find a new career path. Crohn’s made me healthy after being so ill for decades. Crohn’s was, kind of, my saviour. I got out of the shower, grabbed Irfan and sat him down on the sofa. He was really confused around now. Here I was, right out of the shower, wet hair and all, bawling my eyes out. And with that, I buried, divorced — whatever you want to call it — Crohn’s. You see, Crohn’s was over long before my scope. But it was the FEAR that was toxic. Every time I ate something that was not on the diet, or I had a little stress, or would have loose bowels I would FREAK OUT. My jaw would clench, I would get tight in the chest, I would get nauseous — all because I would fear a flare-up. A flare-up that would never happen. The fear of Crohn’s was actually worse than Crohn’s itself. At least during a flare-up, I was in the present moment. My fear would always take me in the future, a future in which I would completely ruin the rest of my life, where I would be on all of these horrible steroids, with multiple surgeries, hooked up to IVs in the hospital. I DID NOT want to live that like anymore. I would like to have a piece of chocolate and not have to place myself in this Crohn’s-filled, horrible future. So, Crohn’s is gone, my friends! Well, most of the time. Sometime he creeps up (he’s male for some reason) when my stomach is touchy or when I want to have an omelette with tomatos (tomatos are inflammatory, after all) but I’m able to kick him to the curb. Well, until he creeps up again. The sooner I see him, the sooner I’m able to give him the boot! Lessons learned: Fear of the Crohn’s can be worse than the having of the Crohn’s (sometimes a flare-up is so horrible, I DO NOT want to downplay the experience of that, but I think you know what I’m trying to say). This was kind of a personal story and I held on to it for a while, but my friend Naaz (my amazing yogi, three-time-cancer-survivor friend who you can follow @naaz_a, facebook.com/yogawithnaaz, popupyogacalgary.com) convinced me to share it. I hope this helps people. Sharing is caring. Sharing helps me. Irfan’s dad sent a link about the Squatty Potty – this is awesome! 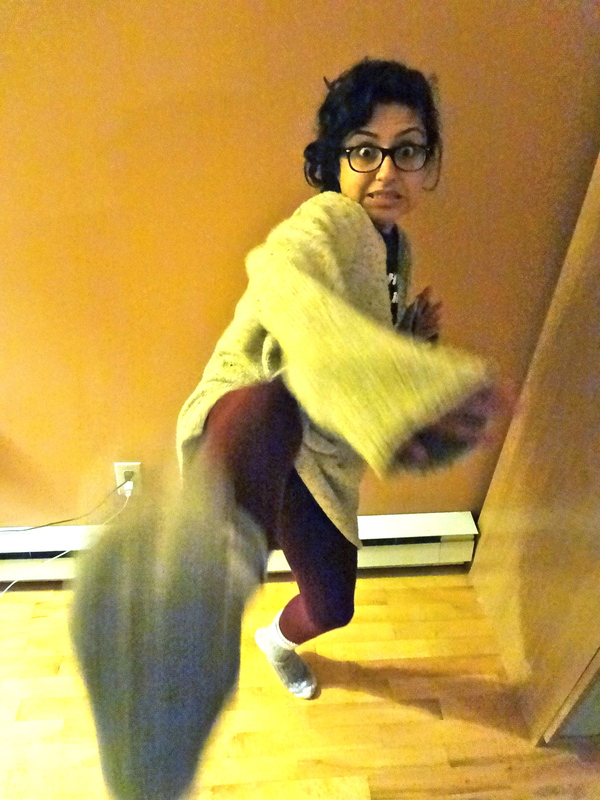 I tried doing this with a stool and let me tell you….pooping time was fabulous. Easy, quick, and minimal struggle – try it out for yourself! 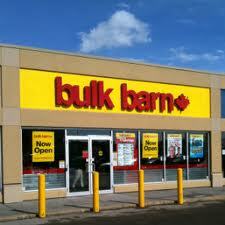 I like Bulk Barn. 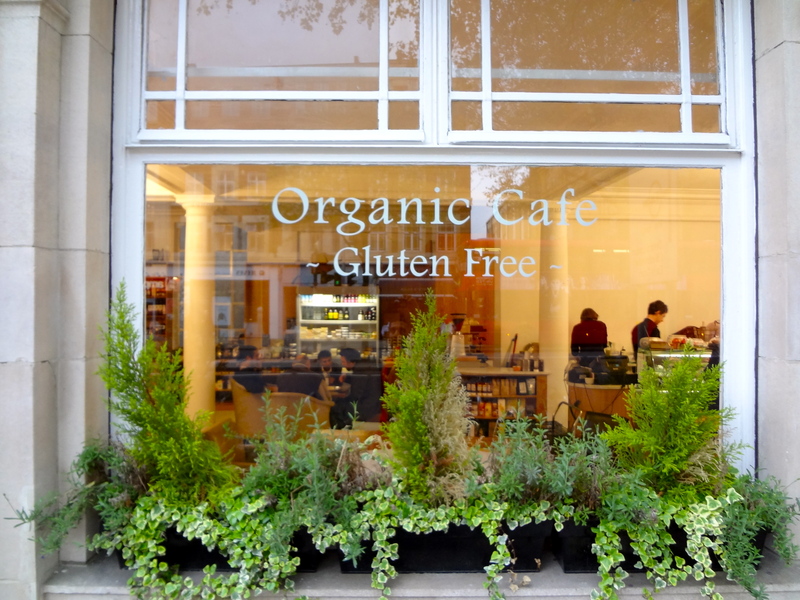 It’s a fabulous place for those people who are gluten free and not afraid of experimenting in the kitchen. Such a range of grains and flowers – the possibilities are endless! It’s also most often a cheaper alternative to buying packaged gluten free flours from Wholefoods or other organic grocery stores. It is for this reason that I buy most of my grains, flours, nuts, seeds, and beans from Bulk Barn. I recently read an article on the dangers of genetically modified (GMO) foods and although I almost eat nothing processed and base my diet on whole foods, I wondered if the products I was buying from Bulk Barn were GMO. Some of their products do in fact indicate that they are NOT GMO but the bulk (tehehehe, BULK) of them don’t say anything. I contacted them and asked them if they could give me a list of their products that are GMO, if any. They said that this would be too cumbersome as they had tons of suppliers all over the world. I then asked them if I could send them a list of specific products to look into – products that I usually buy from there. They agreed and have gotten back to me on some of the items I inquired about. I will keep you all updated with regard to my list. I recommend that you too contact Bulk Barn with your own list – knowledge is power, people! 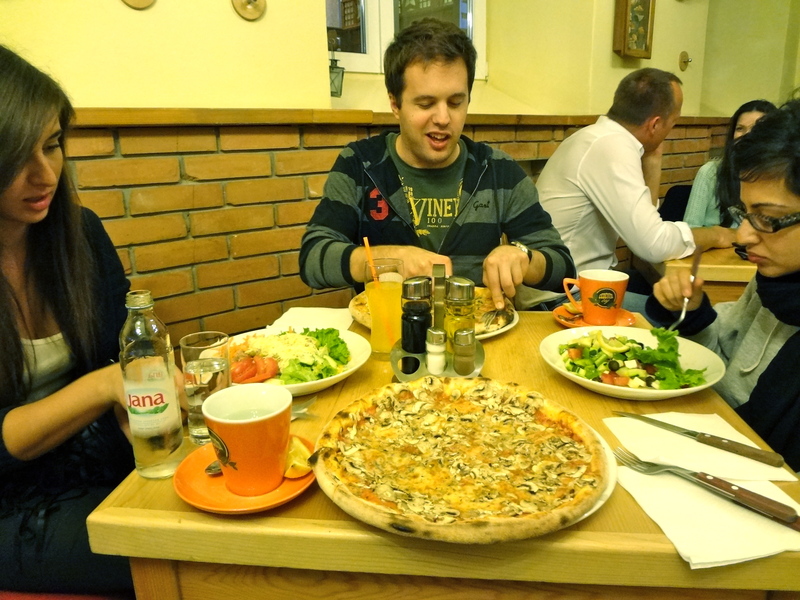 I’m not going to lie, I had pretty low expectations of Chisinau in terms of food. The thought of getting happygut eats seemed almost impossible. 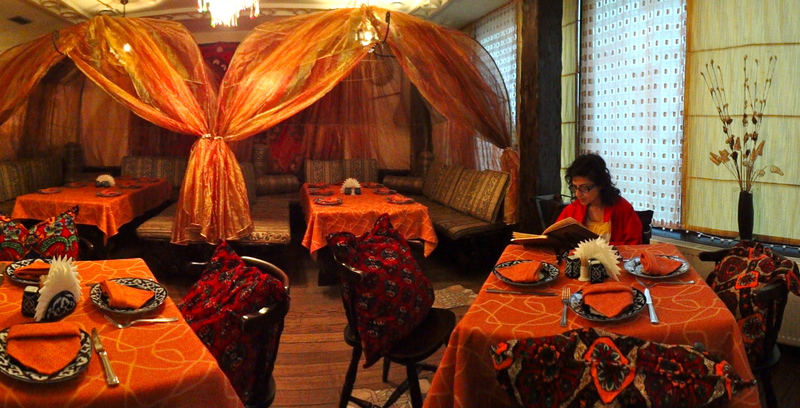 It was for this reason that I was nothing less than stunned when we discovered Caravan, an Uzbek restaurant a 10 minute walk from our hotel! First of all, the ambiance was just fabulous! And, although there weren’t TOO many options on the menu, the restaurant was willing to personalize dishes for us! I had a salad (of course!) to start, followed by salmon and rice for the main course. 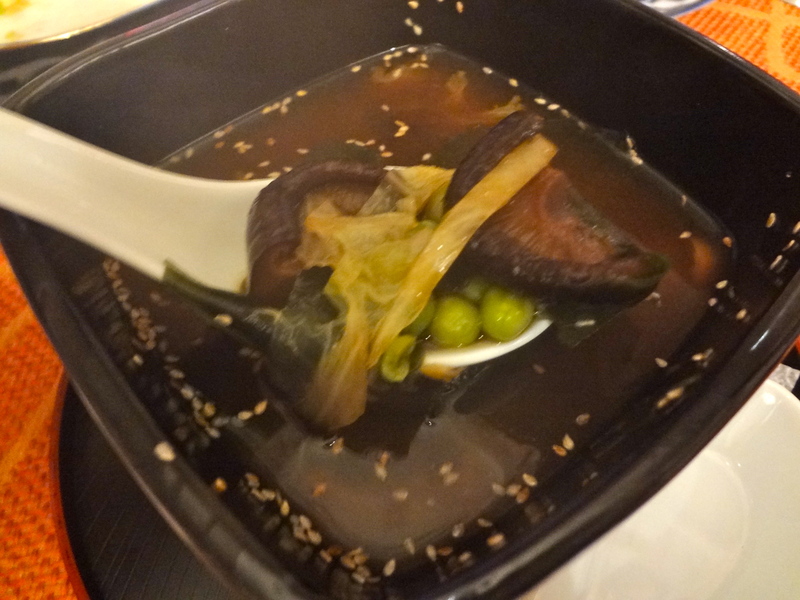 There were very few veggie options for Irfan and so the chef made Japanese soup just for him. Who would have ever thought you could get Japanese soup at an Uzbek restaurant in Moldova? 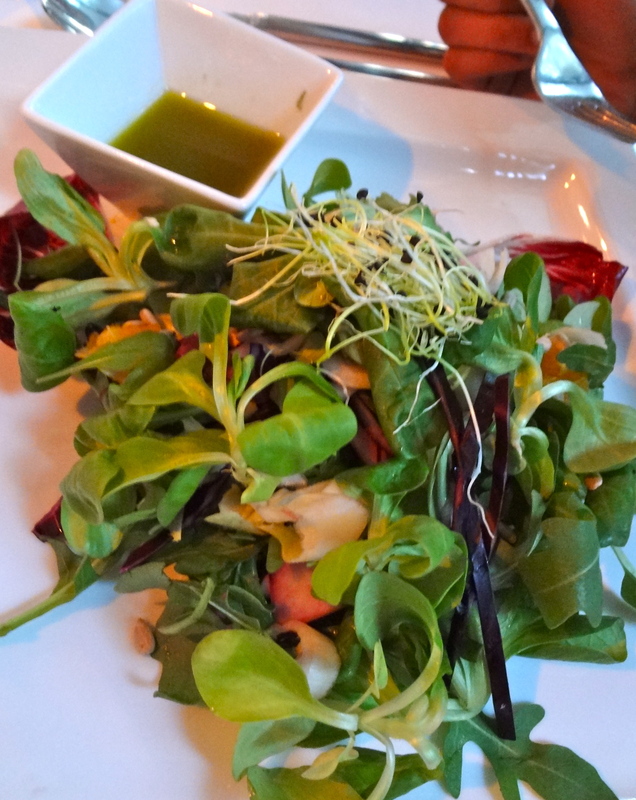 The world is small my friends…..
We had two very equally fabulous meals in Berlin. One was super expensive with mediocre service, the other was super cheap with amazing service. We justify the first expensive meal because it was my birthday! Happy birthday to me! We went to La Mano Verde for my birthday meal. 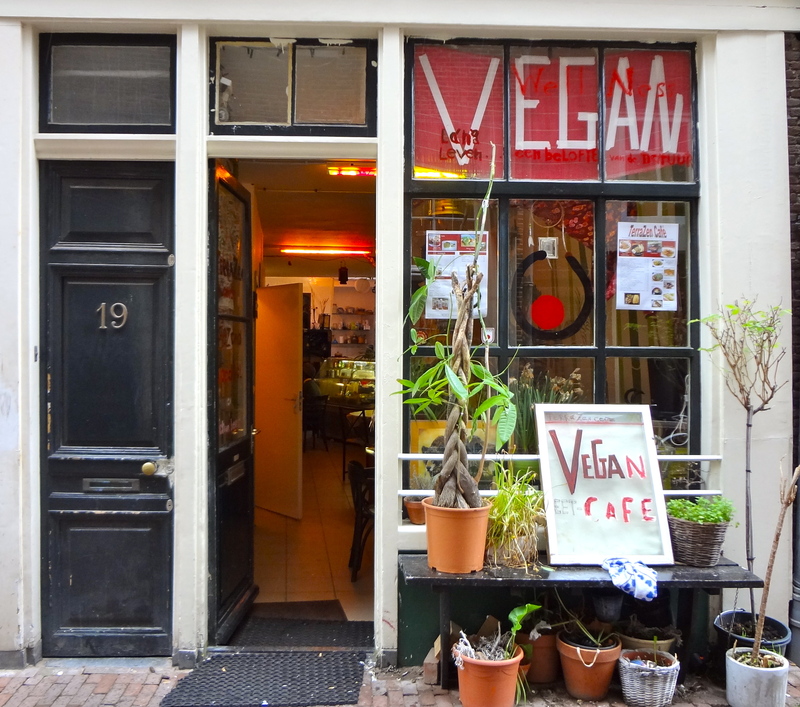 It is a vegan restaurant with plenty of raw choices. 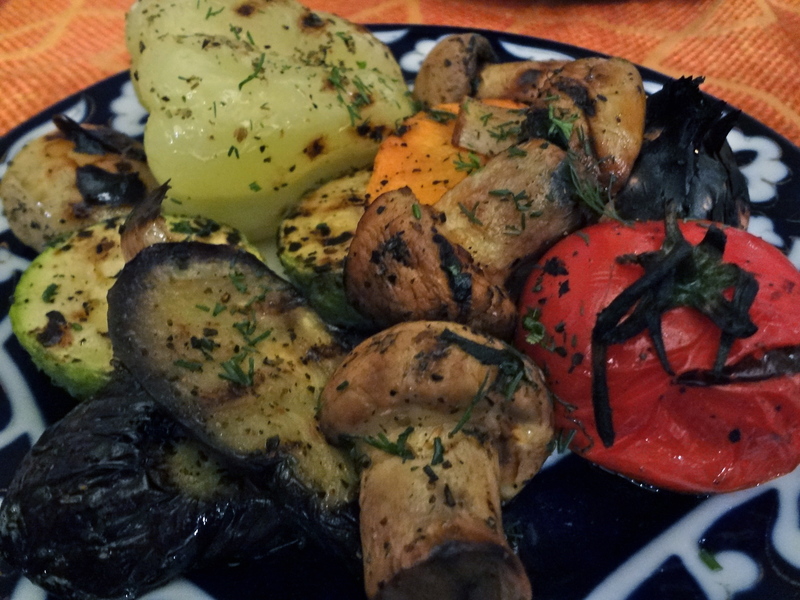 The meal was so expensive and delicious that we decided to take our sweet time eating – we had a 4 hour dinner folks! 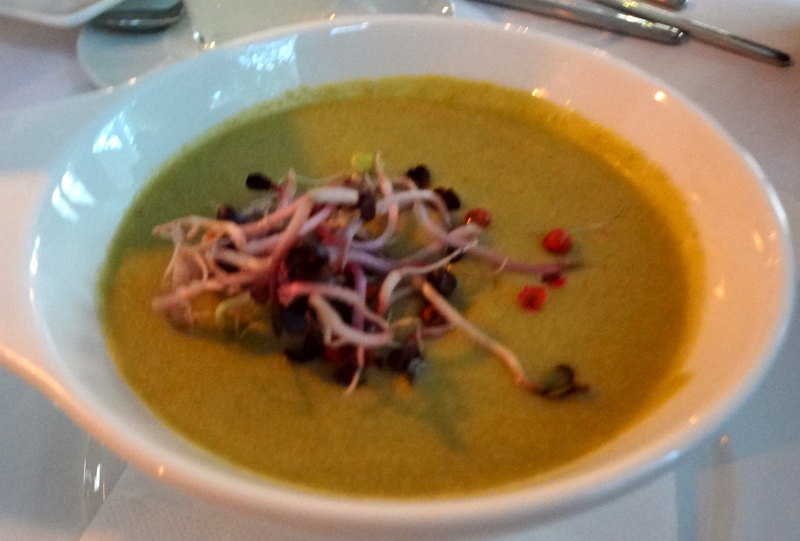 Irfan ordered the Lime-Almond-Gazpacho soup with avocado, chilli and coconut. It was pretty darn good. Jemila got the Ravioli Rouge & Blanc with chioggia beetroot ravioli made with cedar nut cream on a bed of fennel, apple and horseradish salad. It was alright. Not incredibly flavourful but an amazing presentation. 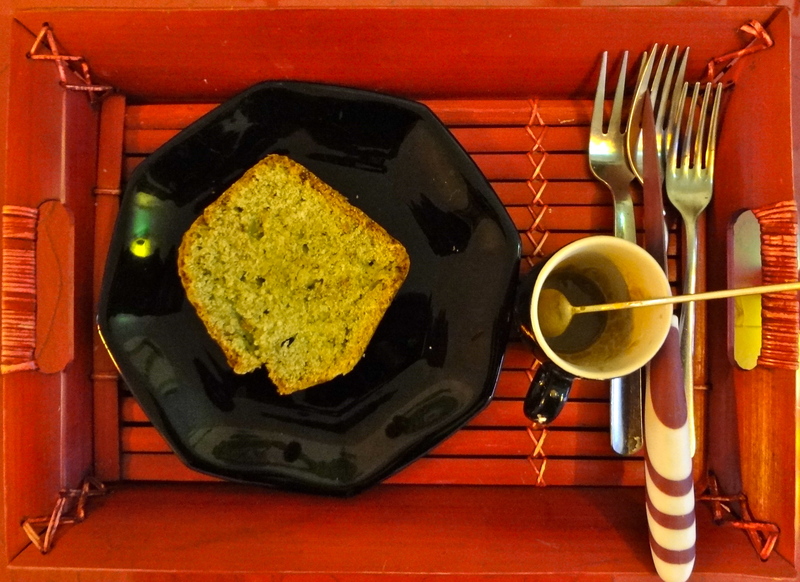 Our friend Chris, who we stayed with Berlin, opted for the Quiche Mano Verde made with fennel, mushrooms, pine nut cream and a Kalamata olive and thyme crust. It was quite tasty. 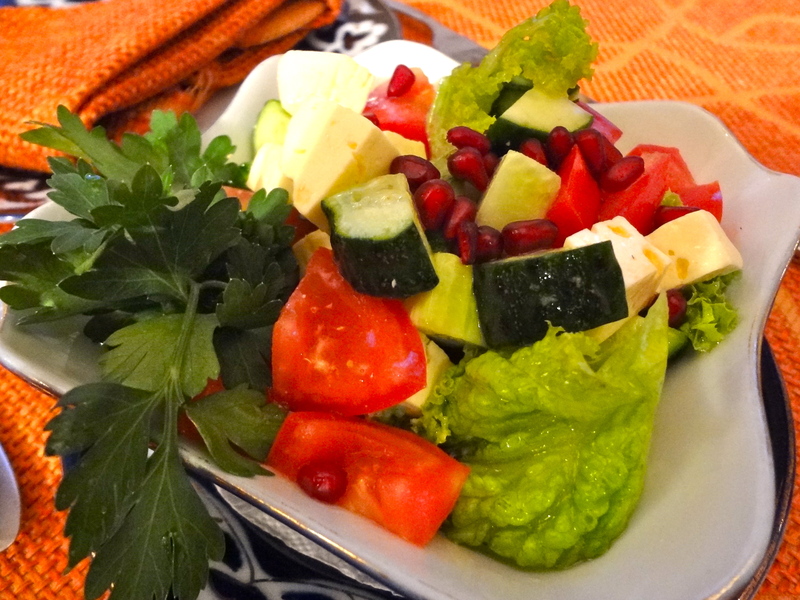 I ordered the safe Garden Fresh Mixed Salad with nuts and seeds and olive oil. It was a good, predictable salad. Irfan ordered the BBQ Seitan Steak served on grilled eggplant and a nut sauce. Irfan liked its crispy texture but thought it was a bit too dry. 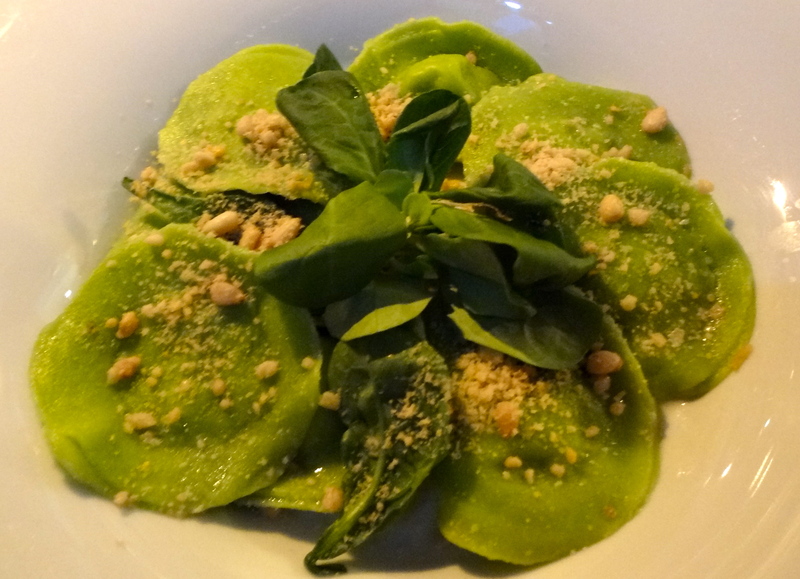 Jemila ordered Cappelletti del Autunno home made ravioli filled with pumpkin and chestnuts, served with a sage and blue poppy seeds glaze, topped with home made nut Parmesan. It looked delicious but tasted a little bit bland. 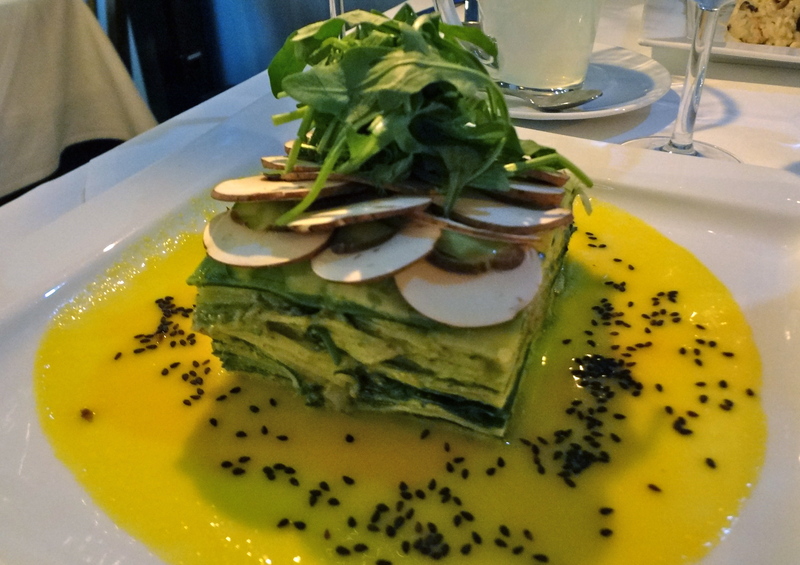 Chris ordered the Mille-Feuille Lasagne with seasonal vegetable layers, bell pepper & cashew nut antipasti. It was good, although we had higher expectations based on its appearance. 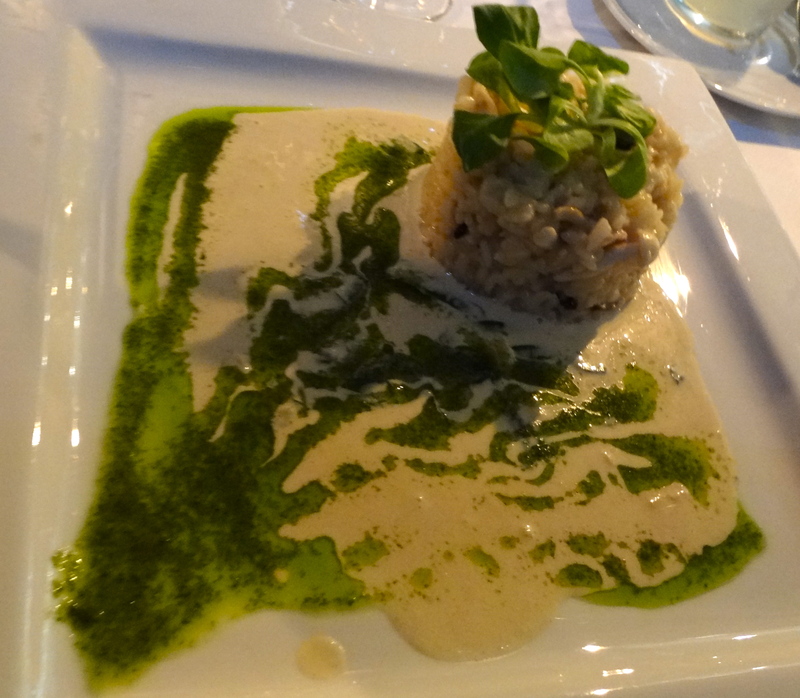 I ordered the Risotto Melange de Champignons with arborio rice, mixed mushrooms, herb pesto and a white wine sauce. It was yummy although a tad too sweet for a main course in my opinion. 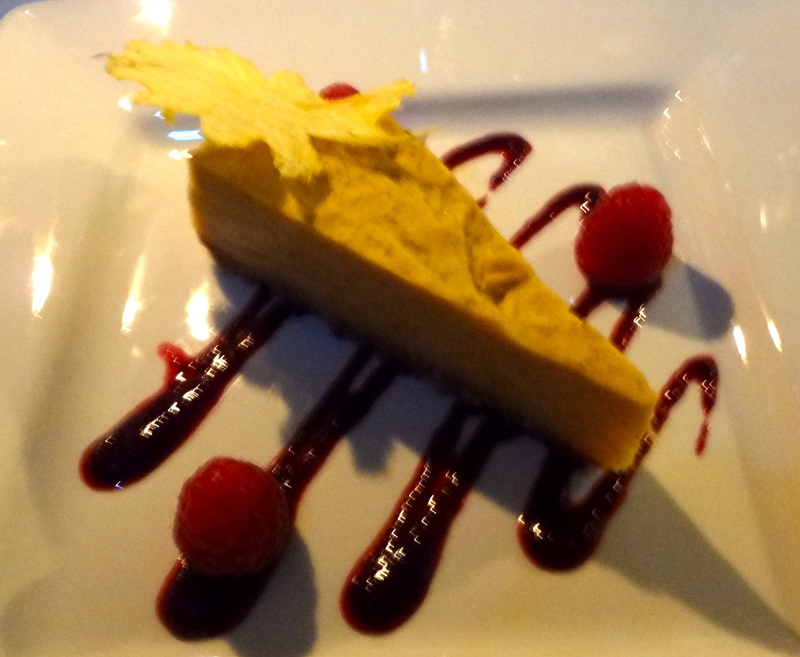 Jemila had the Apricot Cheesecake with berry sauce and lemon zest. It was delicious. Irfan ordered the Golden Orange Creme Brulee with ginger, lemongrass, served with candied kumquats and fresh fruits. 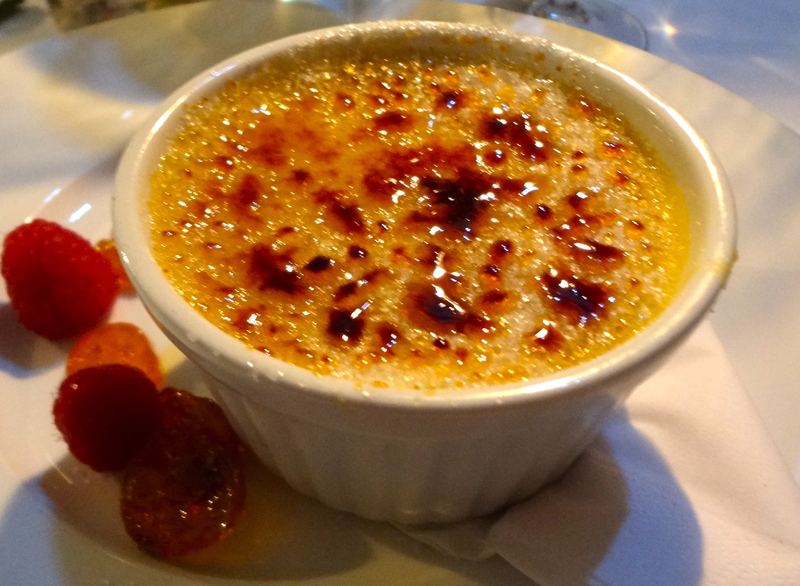 Although it looked like creme brulee, it tasted more like a custard. 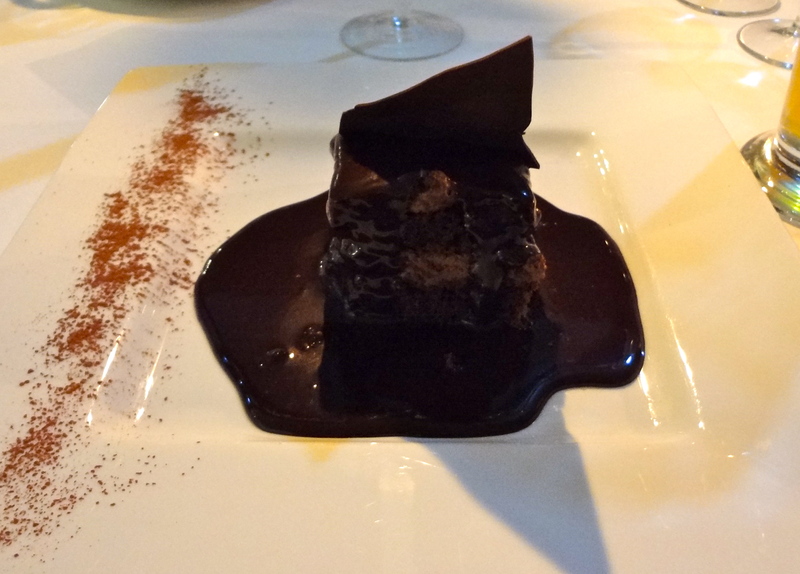 Chris ordered the Triple Chocolate Fudge Cake topped with hot chocolate sauce. Although this beauty was NOT gluten-free it was sooo delicious (yes, I cheated on my birthday! so sue me already :P). 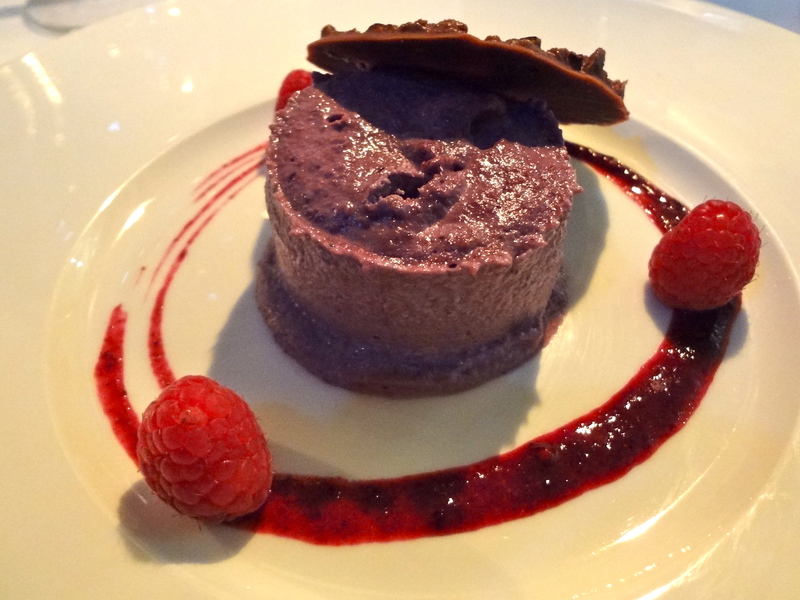 I ordered the Cheese Cake Mano Verde with mango cashew and lime, served with a berry coulis. It was really good. If you’re a raw foodie with deep pockets, I would definitely recommend this place. If you are like the rest of us who are a bit more thrifty, I would pass. 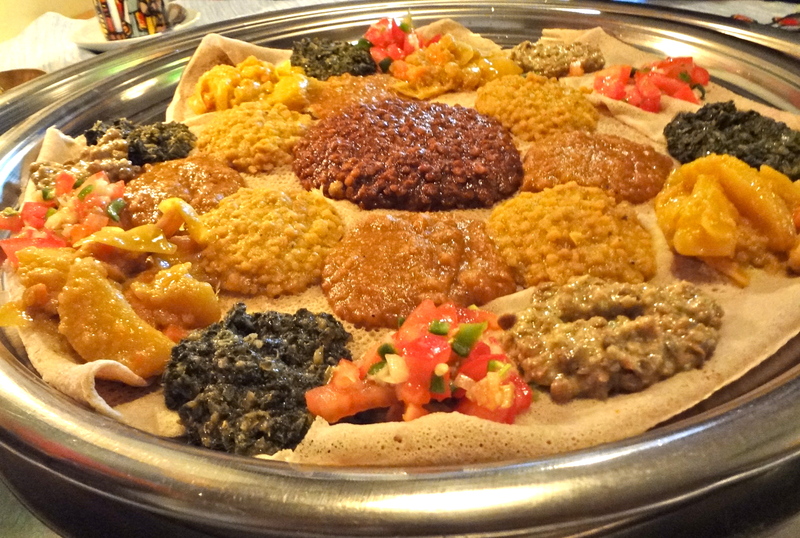 Our second happygut eat in Berlin was Bejte Ethiopia, a hidden gem by Berlin’s red light district. We ordered the veggie platter which was soooo delicious! It was hands-down the best meal on the trip. 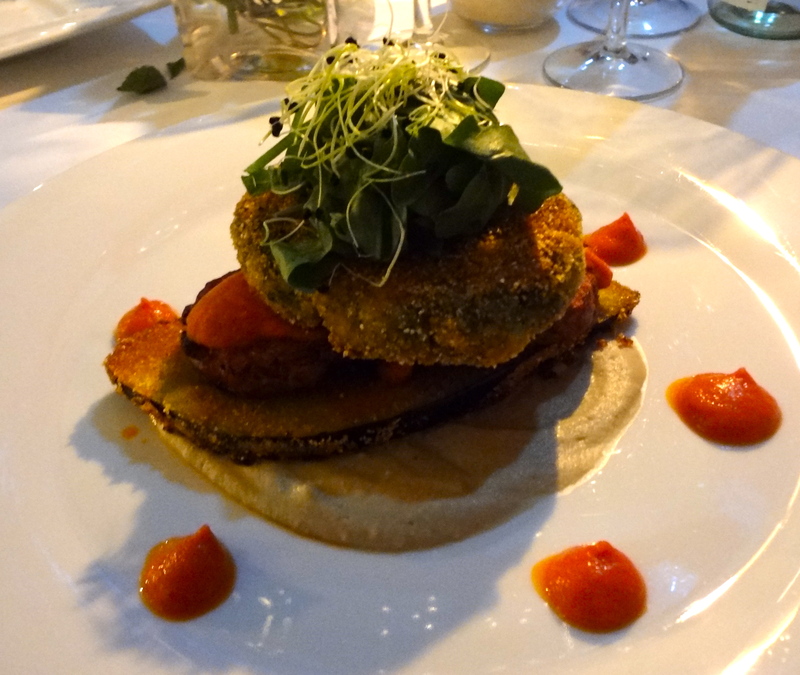 The food was bursting with flavour, the price was right and the service was excellent. The ambiance was festive and the environment was so warm and friendly. And, even though the place was packed the owner still made a point to personally take our order. If that wasn’t good enough, there was even complimentary tea and fresh popcorn! We loved this place! 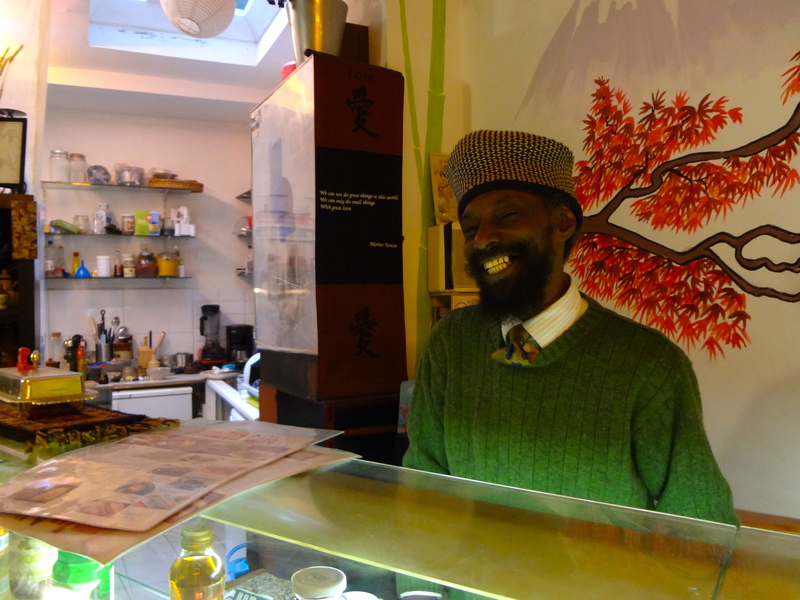 Please do make sure to check out Bejte Ethiopia if you are ever in Berlin! I ate a lot of salads in Zagreb. Europeans love their inflammatory gluten-filled pastries and so I didn’t have many options eating out. 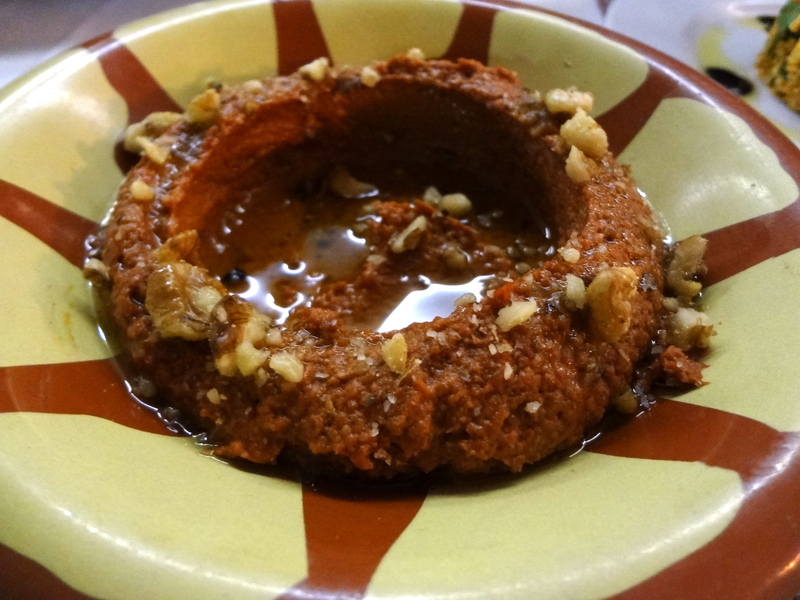 So let me tell you, I was pleasantly surprised when we were able to find Delizie Libanesi, a Lebanese restaurant. The meal was delicious! We were starving and so we ordered a ridiculous amount of food and, to our surprise, finished it all! Unfortunately, I think we were too hungry to remember to take pictures of all the dishes. We managed to take a couple of shot of our appys though, here they are! 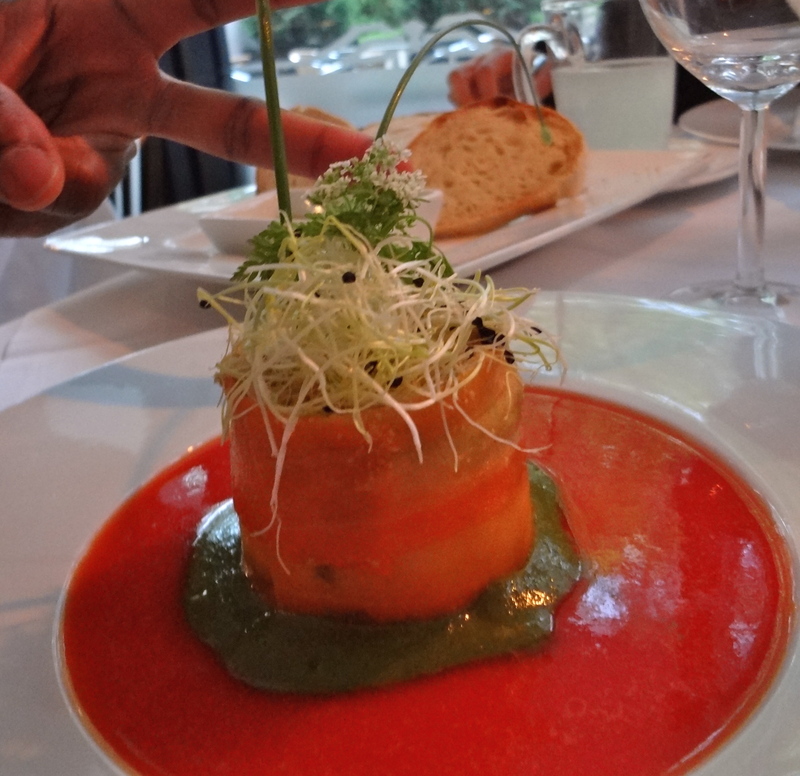 Irfan ordered a red pepper hummus which was de-lish! 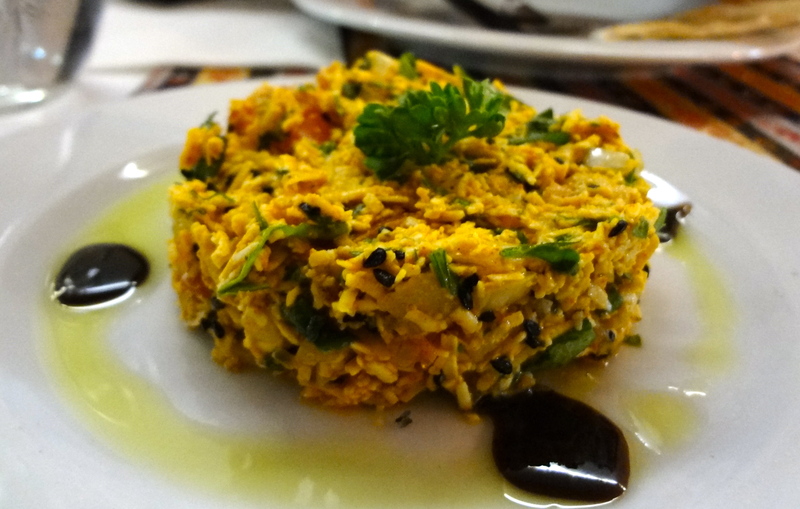 Darjan ordered a traditional Lebanese dish with herbs and rice. I ordered a flavourful lentil soup with tandoori chicken and rice (maybe not sooo happygut friendly but I was so sick of salads man!). Hence, Delizie Libanesi was a good option in a place with few options. The waitress was super happy and bouncy, which was an added bonus. Worth an eat if you’re ever in Zagreb! Vijay Uncle repeatedly insisted that we check out the restaurant just below his flat, Zonqor Point. 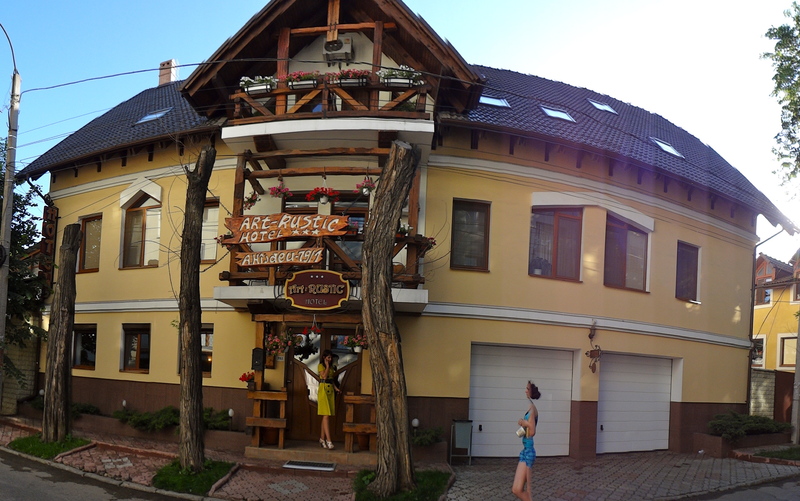 We waited until our last night there to finally check it out and I wished we had discovered it sooner! 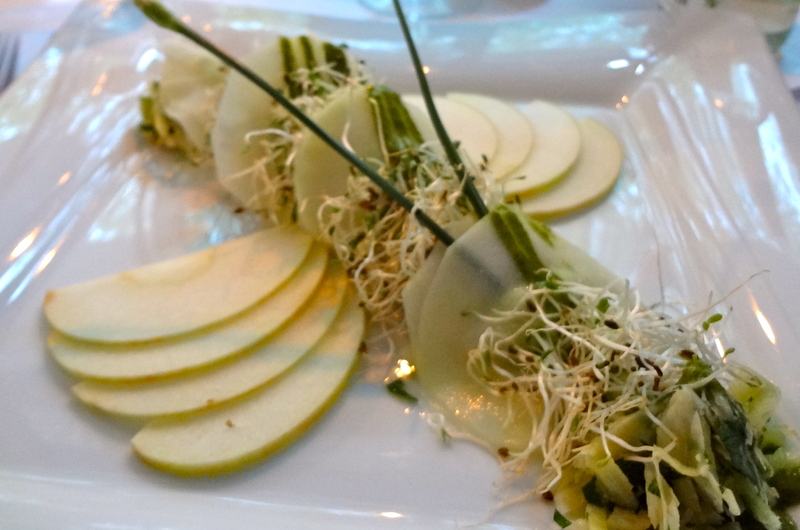 The service was amazing and the food absolutely delectable. 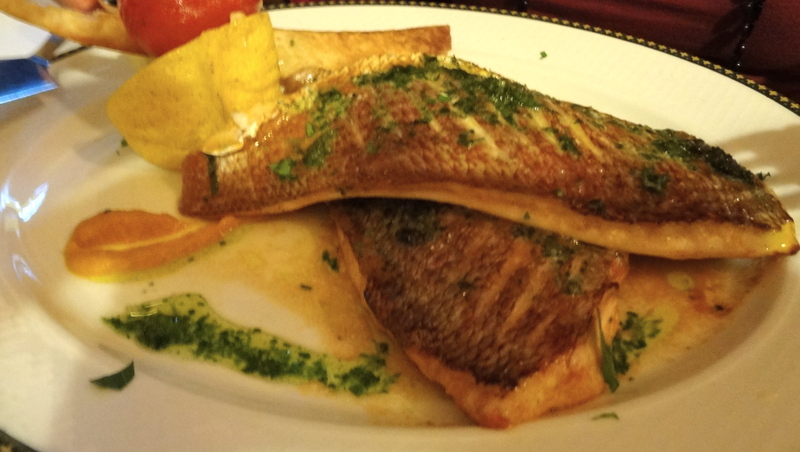 Jemila and I had the red snapper which was caught the very same day! 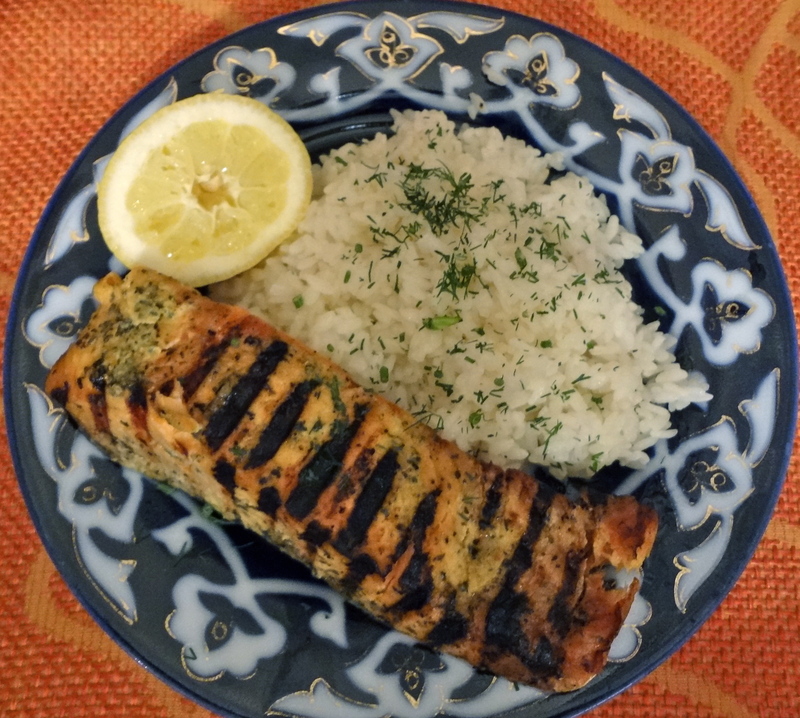 It was cooked to perfection with garlic and dill. The owner, Jason, made it a point to visit each of his customers personally to ensure that they were properly cared for. Make sure to check this place out if you are ever in Malta! After London, Irfan went to Amsterdam while I went straight to Malta. 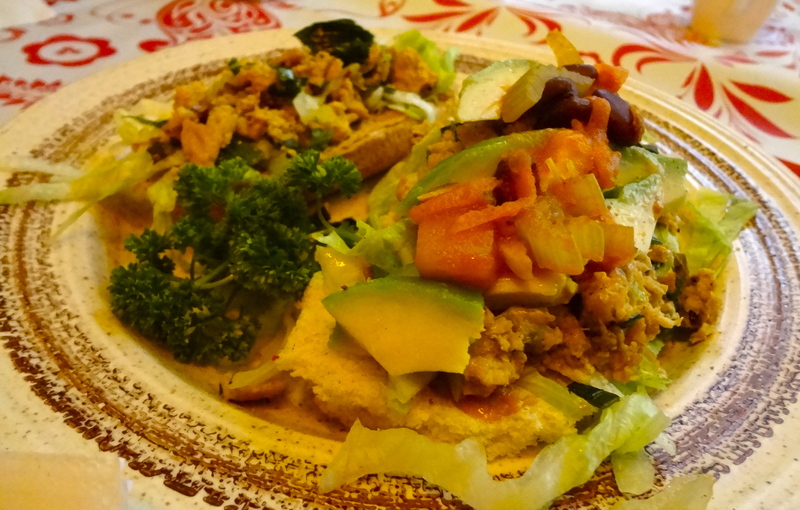 He raved so much about this Terra Zen Vegan Cafe that I decided it was a must-blog. He loved the down-to-earth-homey-family feel. The owner’s toddler son was running around with a water gun while his 10-year-old daughter helped with taking orders. Irfan had the vegan burger plate with avocado on the side and ginger tea. When the dessert that Irfan wanted from the menu was no longer available, the owner said he did have another cake in the back that wasn’t on the menu. “What kind of cake,” Irfan asked. “A cake made with the best flours, filled with nuts seeds and banana. I call it the Survivor Cake,” the owner answered. “Why is it a survivor cake?” asked Irfan. 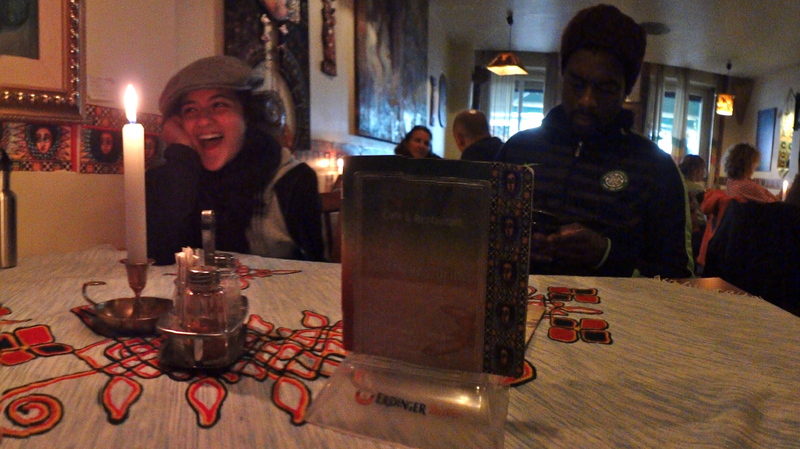 The owner smiled and stated, “It’s for me, because I’m surviving.” Irfan loved the cake. It even came with the “special sauce” made from heating chocolate soy milk with cane sugar. Although, I must admit that I am incredibly envious of the British accent (omigodness, me and my sister-in-law Jemila had WAY too much fun trying to speak with the accent while we were there, they should never allow us into their country again), London is NOT my favourite place on earth. It’s grey and rainy and cold. The English also tend to be, as my friend Darjan (who lived in London for 15 years) so eloquently noted, “emotionally constipated”. Now, this is probably an unfair stereotype and I apologize to all the Brits out there who are emotionally regular (get it?! like regular bowels? bahahahaha!) 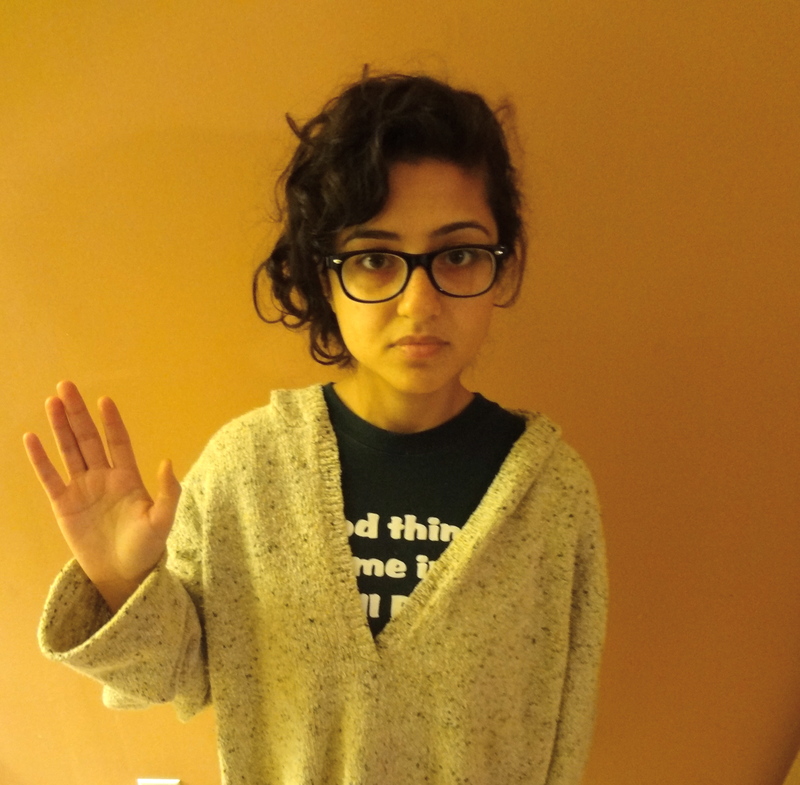 but we all have live with stereotypes. Some are true (e.g. Canadians love to say “I’m sorry”), some not so true (we pronounce about “aboot”, I have never heard anyone say “aboot” ever, in my whole life). As usual, I’m getting off track. Back to London and happygut food. So, I wasn’t SUPER excited to be in London but the city quickly redeemed itself whenever I discovered this little gem the first day we arrived! 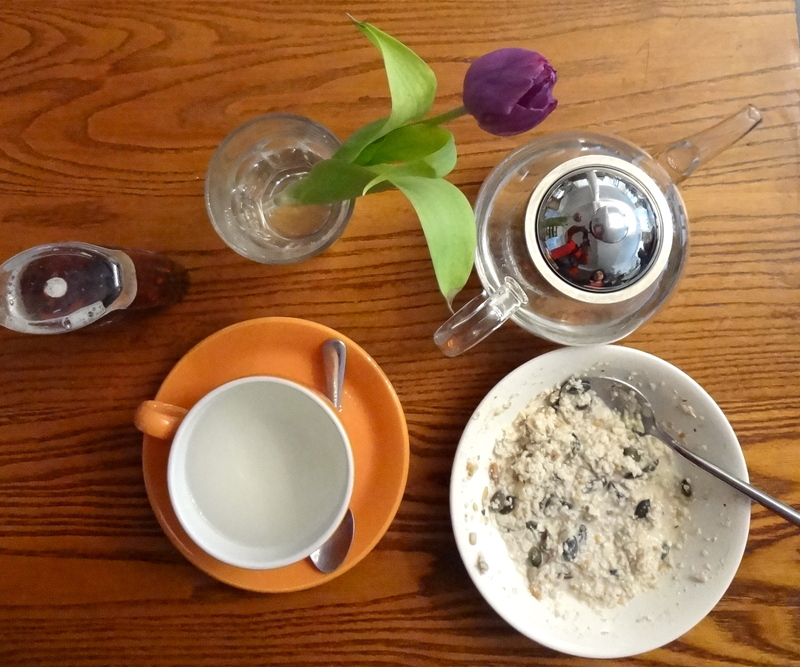 Luscious Organic is a quaint cafe with superb service! The food was excellent! I had a delicious coconut lentil soup for dinner the day we arrived and muesli with fresh ginger tea for breakfast the next day. They even had a selection of gluten-free vegan cupcakes! 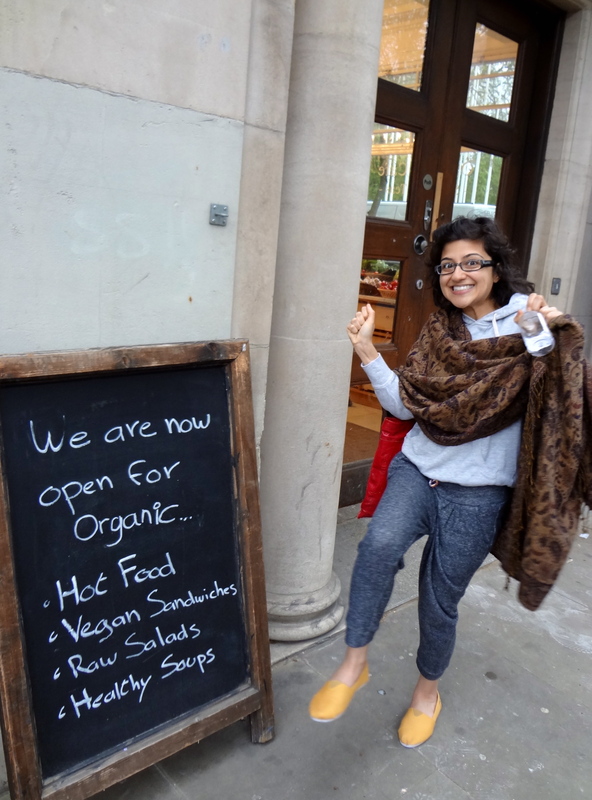 Do check out Luscious Organic if you are ever in London!